MARITAL STATUS : Married with 4 children. LANGUAGES : Arabic, English, German and Greek. Internship in Ministry of Health. Jordan. 1977-1978. Certificate of Equalization as Consultant General Surgeon from Saudi Association for Health specialty. Consultant General Surgeon and Head of Surgical Department. In KKH-Hail, since 08/01/1999 up to 10/4/2012. 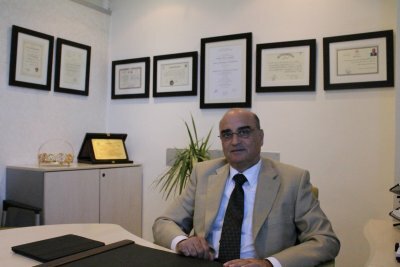 Consultant Surgeon at King Khalid Hospital-Hail –K.S.A from 11-7-1997 up to 10/4/2012 during this period I was the haed of surgical department which consist from all surgical subspecialitys,leading the surgical team,organizing the work & supervising all departmental activitie incloudind training the new collegues in laparoscopic procedures. Consultant Surgeon – KKH- Alkharj- K.S.A – August 1991-June 1997. Reference Dr. to Private Hospitals in Jordan 1986-1988. 1. October 1969- I got registration in Aristotelos University- Greece and started for one year to complete a language and preparatory course. 2. October 1970 to February 1977 –Medical School aristotelos University- Greece. 3. June 1977- April 1978 internship in Ministry of Health Hospitals Jordan. 4. June 1978-October 1978 – Course in German language in Bochum University West Germany. 5. December 1978- August 1985 – Surgical Resident in West Germany. a.) December 1978- May 1979 – St. Vincent Hospital ,Datteln. b.) June 1979-December 1980- Resident surgeon in St. Joseph Hospital Gensen Kirshen –Horst. c.) January 1981- August 1983- Resident in St. Joseph Hospital – Salzkotten. d.) August 1983- august 1985- Senior Resident at the same Hospital. 7. June 1987- Jordan Board in General Surgery. Course in Hand Surgery at Munster University Germany- 1984. Organizing and sharing in the yearly Surgical Symposium of our Department and the surgical club of Hail region. Sharing in Laparoscopic procedures in Morbid Obese patient with the team of King Faisal Specialist Hospital, Riyadh during the visits of King Khalid Hospital- Hail,then performing the procedures indepndantly. Workshop for single port for Lap. Chole. Running the thyroid clinic for surgical diseases and performing Thyroid surgery at KKH since 1420. Running the Breast clinic and procedures at KKH since 1421H. After training course at KFSH & resurch center.